– nationwide service you can count on! Moving to a new state can be a huge undertaking that brings along with it extra stress. 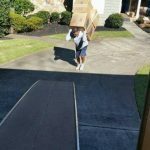 RLD is the Akron Ohio interstate moving compay who can simplify your long distance move and deliver stress-free and affordable moving services. Leave it to us to make things easier for you. A successful interstate move starts with an accurate move estimate and a well-structured move plan. RLD will come to your home, survey your household possessions, take note of special needs or items requiring extra special handling, and present you with a thorough and accurate move cost estimate. Then on move day, RLD will professionally manage every step of your move. We provide personalized on-site service in Ohio, we track and monitor your shipment while in transit, and we orchestrate the delivery at your final destination to make sure that your move goes smoothly form start to finish. Arpin is an industry recognized leader in interstate moving safety and service quality. As a TOP 5 national van line, Arpin provides us with the nationwide resources to manage your move from Ohio to any part of the United States in a seamless and efficient way. We ensure that your possessions arrive on-time and exactly how you packed them. Our team of experienced move professionals are highly skilled in completing each job in the utmost efficient manner. Whether you are moving from Akron, Cuyahoga Falls, Hudson, Kent, Massillon, Medina, Perry, Stow, Wadsworth, or any anywhere throughout Ohio or beyond, RLD Relocation and Logistics is ready to deliver. RLD Relocation of Akron Ohio— customer care and satisfaction are our top priority.